The Candwich could have changed the world. With $145 million in potential funding, it was poised to be the Coca Cola of the sandwich-enclosed-in-aluminum market. But things went awry, as the money was never meant for candwiches at all. According to an SEC lawsuit, Travis L. Wright raised $145 million from 175 investors between 2001 and 2009. Their investment? Commercial real estate with a promised 24% return. He spent $6 million on the real estate. With an undisclosed amount of the remaining cash, Wright invested in a variety of other projects, like rose petals printed with greeting card sentiments and even the next canned food craze: Candwiches. 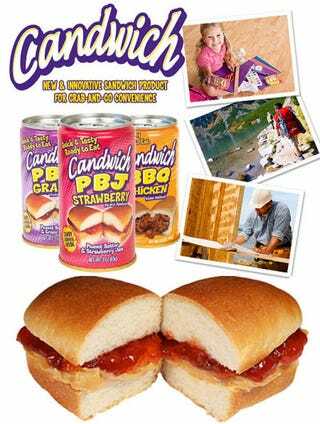 Yes, sandwiches in a can, including planned spin-off flavors like Pepperoni Pizza Pocket and French Toast.